Last year, Splio published this infographic, discussing the incredible progression of Black Friday for European retailers and e-tailers. The 2017 edition of Black Friday was a real success in Europe but it doesn’t have the same format or the same objectives as in the USA. Here, we’ll take a look at what conclusions can be drawn regarding 2017, what are the plans for 2018 and which strategy to implement for November. 2017 Black Friday - Drawing Conclusions. Does Black Friday only happen on November 23rd? Last year, promotions lasted 8 days on every distribution channel! Online or offline? Both! Black Friday is omnichannel. Retailers and e-tailers can redirect traffic to only one of their distribution channels or to both their website and physical stores. The website Black-Friday.sale mentioned a 30% rise in online sales and a 33% rise in global sales for the 2017 edition. Black Friday for retailers and Cyber Monday for e-tailers? The one and only seasonal event for everyone! Black Friday took over Cyber Monday for a week of promotions. 2018 Black Friday rule: “ surprise me ! ”. Promotion isn’t necessarily a bad word and doesn’t have to go along with outrageous promotions. Black Friday isn’t (in Europe) synonymous with key words in capital letters, spam and fluorescent yellow billboards. It’s up to you, Marketers, to make your own Black Friday, to kick it up a notch and to create a seasonal event that makes sense for your brand, your clients and your prospects. Give meaning to your promotions! Black Friday is a seasonal event that attracts customers mostly because it gravitates around promotion. But which experience do you want to offer to your clients during this period? Your strategy this year will be to give meaning to the promotion by communicating your positioning and your philosophy about Black Friday: create an event, yours. What is your client philosophy for Black Friday? Don’t forget that it’s happening right after Thanksgiving in the USA, a strong family gathering. Is it the right time for your clients to enjoy it? To surprise their families? To think ahead about Christmas in order to make this moment even happier and more emotional? What positioning for your brand? Is it time for you and your brand to communicate about a value you care about and use Black Friday as a platform? What if you opt for transaction and good deeds during 2018 Black Friday? We saw that Black Friday is happening the day after Thanksgiving. But it also happens one month before Christmas. To give meaning to your Black Friday, while keeping in mind its sales value, you could think about micro-donations and cooperate with NGOs. A solidary Black Friday or for charity? That’s an engagement that will surely please Millennials and give you the opportunity to do a PR campaign. 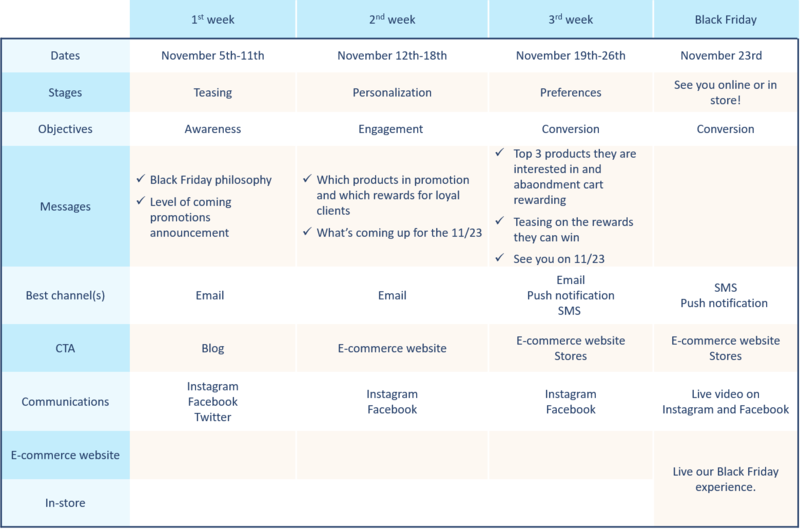 What strategy in November: promotions or emotions? Gain or retain with Black Friday? Both! Take advantage of Black Friday by setting up both a loyalty campaign and an acquisition campaign by segmenting your database with these two segments. Adopt a transactional communication tone of voice with your prospects and a relational one with your loyal clients. A campaign visual that captures your readers’ attention, an overall theme and a great personalized message per person. Then, thanks to your knowledge about your customers and to personalization, you can use this event to invite your loyal clients in-store or to your online boutique and offer them a promotion for a product that they’ve previously shown interest. Promotions for everyone and personalized attention for your loyal clients and ambassadors with the momentum you will create around Black Friday, the unique experience you’ll make them live on your e-commerce website or the retailtainment you are organizing in your busiest store. So what’s the schedule for Black Friday? Start your communications in early November, right after Halloween, and adopt a regular omnichannel communication, beginning with a weekly emailing, in accordance with the special strategy you are planning for Black Friday. Starting November 5th, tease your clients and prospects by announcing Black Friday week and what you’re planning to do on 11/23. An email with a countdown in real-time (each time your recipient opens the email, the countdown is updated) would be a good way to peak your readers’ curiosity. It may also be the occasion to explain your philosophy around this seasonal peak: the moment to enjoy yourself or to make the persons you love happy? Customize your messages thanks to your the knowledge about your customers and taking into account the analysis you’ve done after the last emailing. Give seasonal advice, talk about a present they may like according to their buying history and suggest a good deal for their relatives. Analyze open and click rates from your previous campaigns and highlight the top 3 products they are interested in with the promotion they deserve. Think about the gifts for loyal clients, the Black Friday little bonus. Encourage visits to the website or in-store! Live communication about your event online or in-store! Until the Cyber Monday, let your clients have access to the last good deals. Black Friday may be the occasion for your brand to make a difference inside a tough market while keeping in mind your conversion, loyalty and sales objectives. Have a great sales period! Splio's 10 commitments to move to new loyalty.